Blaine: 00:01 Well, this is gonna be interesting. Honey: 00:03 It'll be a first for us. Blaine: 00:04 I'm drinking yesterday's coffee. And this is the first time we've ever recorded so far away from each other. We're usually never more than six inches apart. Honey: 00:13 I'm glad you said you're drinking coffee. That little gap between "I'm drinking yesterday's" and the word "coffee", I'm like, "Oh my gosh, what's he drinking?" Blaine: 00:22 What else would there be? Honey: 00:24 Well, I'm just saying I'm glad it's coffee. Blaine: 00:27 Oh, yesterday's martini would be awful. And who leaves a martini sitting around? Honey: 00:31 And I know. It would just be a little sad. Blaine: 00:34 Especially for breakfast. Honey: 00:36 I think it just got sadder. 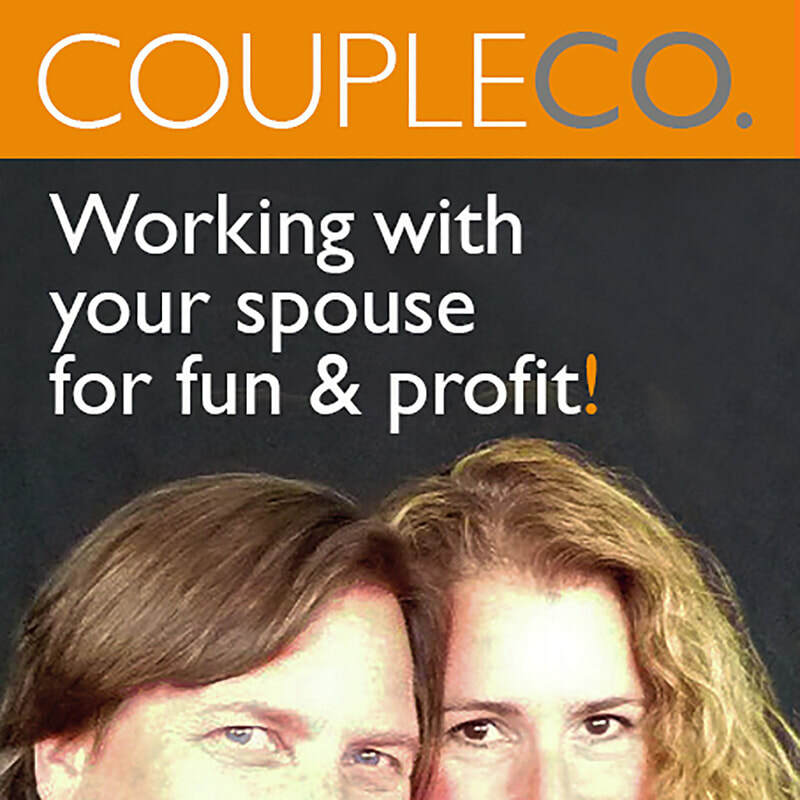 Blaine: 00:38 Welcome to CoupleCo: Working With Your Spouse For Fun & Profit. Honey: 00:42 It's business, and it's personal. Blaine: 00:43 I'm Blaine Parker. Honey: 00:44 Which makes me Honey Parker. Blaine: 00:46 And as a couple in business together, we're coming to you from The CoupleCoach, our compact Transamerican land yacht. Honey: 00:51 We are navigating the nation in search of standout couples in business together. Blaine: 00:55 And we're bringing them to you so you can hear their inspiring stories of crushing it in business, without crushing each other. Honey: 01:01 This show is also brought to you by a couple-owned business. Blaine: 01:03 Smokin' Mary's Smoked Bloody Mary Mix. Honey: 01:06 Made in small batches with no reconstituted tomato juice. Because who really wants that? Who wants reconstituted anything? Blaine: 01:16 I'm drinking reconstituted coffee right now. Honey: 01:18 And are you enjoying it? Blaine: 01:19 Not at all. Honey: 01:20 There's my point. They use only fresh, whole tomatoes. Blaine: 01:24 Smokin' Mary's Smoked Bloody Mary Mix. Hey, nice tomatoes! Online it's smokinmary.com. Blaine: 01:30 In this episode, we're doing something that has routinely proven to be a huge win with our single most popular guest ever on this show. Honey: 01:37 We're talking to psychologist Dr. Rachna Jain, who's interviews are always in the CoupleCo Top 10. Blaine: 01:43 And today, we're talking to Dr. Jain about a critically important exercise for any CoupleCo. Honey: 01:48 And it's something that many, many CoupleCos ignore and we've kind of been guilty ourselves. Blaine: 01:54 Yes, we have. For 15 years. Actually longer than that. Oh, man. We're talking about something that's good for the new year or for any time of the year since it never goes out of style. Blaine: 02:08 No! We're talking about that time-honored tradition of new beginnings goal setting. Honey: 02:13 But we're doing it in a way that you'd never expect, through the power of one. Blaine: 02:17 Ironic for a CoupleCo perhaps. Honey: 02:19 But this is a really powerful, potent, and appealing dynamic for setting goals. And it even appeals to me. Blaine: 02:25 And if you know Honey, this is huge. She loves to exercise. She's a fiend for CrossFit. But she hates doing written exercises. Blaine: 02:33 So, here now, Dr. Rachna Jain of inloveandbiz.com. Blaine: 02:41 Okay, this is the excitement and the thrill of 2019. And yes, it is the New Year, but this interview is going to be relevant any time of the year because it is perfect for any couple who is looking to set goals and set them big. And we are speaking with everyone's favorite couples psychologist, Dr. Rachna Jain of inloveandbiz.com. Blaine: 03:03 Say Happy New Year to the people, Dr. Jain. Dr. Jain: 03:05 Happy New Year! Blaine: 03:07 Yay! Honey, are you gonna join us? Honey: 03:11 Happy New Year, people. Dr. Jain: 03:30 Sorry. Sorry. I didn't know that was my cue. That was my cue. So we're going to be editing that. Okay. Blaine: 03:41 I was just gonna see how long it takes before she sees it's her cue. Dr. Jain: 03:45 Oh my God. Oh my God. Honey: 03:47 So apparently the goal for the New Year is humor. Dr. Jain: 03:49 That's right. The goal for the New Year. Blaine: 03:52 Can you ever really have enough? Dr. Jain: 03:53 Apparently not. Alright. So can you set that up again? Dr. Jain: 03:58 I said that actually it is a really good topic to look at that, because most couples set goals wrong. Blaine: 04:05 Really? We set them wrong? Dr. Jain: 04:06 They do. You set them wrong. Blaine: 04:08 Honey, you hear that? We been doing it wrong. Honey: 04:11 Well, that doesn't surprise me at all. But when you say that we're setting goals wrong, are ... What do you mean? Are we setting the wrong goals? Or we're going about it incorrectly? Honey: 04:54 Oh, I think the world calls it that now. Dr. Jain: 04:56 They call it now? Yes. Exactly. Blaine: 04:57 Yeah, the whole world. Honey: 04:57 The whole world. Dr. Jain: 04:59 So what was I .. I was saying that so couples set goals wrong. And that usually happens in one of two ways. One way is that they each set goals individually and they just assume that because they're a couple and they're a CoupleCo, that their partner is agreeing to those goals. Or, of course, like it's just sort of self-evident that those are the goals they'd want to reach. Honey: 05:24 You mean it's not? Dr. Jain: 05:25 The other ... No. Honey: 05:25 Well, we've definitely done that because ... I don't know about other people ... But I tend to have these long monologues in my head. And then when you finish, you kind of assume because the other person was in the room that they were privy to it. But they never were. Blaine: 05:39 Yeah. I know what I'm thinking. Why don't you? Dr. Jain: 05:42 Exactly. Or the other thing is is when you have a couple who has been married for some period of time or maybe dated for a period of time and they've been in business together for some amount of time. There's a lot of assumption. There's a lot of assumption in our communication. So if one member of the couple says something, they assume that it means the exact same thing to the other member. Dr. Jain: 06:03 So a case in point, we were talking about this that if one couple says, "Okay, our goal for this year is to make more money", well, then they'll assume that the other person in the couple will just know automatically what it means to make more money. And aside from agreement on the goal, they'll also agree on how that should happen. Should it happen through cutting expenses? Should it happen through selling more? Should it happen through more time away from home because you're out on the road going to trade shows or doing something like that? Dr. Jain: 06:35 So it's actually the assumptions that are the problem. And that's why communication is really important. Blaine: 06:42 So we say, "I know, let's make more money." And I'm thinking, "Well, that means we have to triple our rates." And Honey thinks, "Well, that means we should be working 16 hours a day." Dr. Jain: 06:50 Exactly, exactly. Blaine: 06:52 And we never communicate about it. Dr. Jain: 06:53 Correct. And a lot of it comes from the individual members own background and history. So if one member of the couple really believes in the importance of hard work, many of their goals are going to relate to, "How do we work harder?" You know? And the tricky part is is that many times we marry somebody who is a little bit opposite of us in certain ways. And so you have one person who is a very hard worker marrying somebody who maybe believes that life is a little bit easier, or that hard work isn't the only way to accomplish something. Dr. Jain: 07:25 And so then you got this one person assuming that to make more money, you're gonna have to work really hard. And that's going completely opposite of the other member of the couple who has a different way of reaching that kind of goal. Blaine: 07:37 Okay. So you have a solution for this? Dr. Jain: 07:41 I do. And so that kind of plan that I wanted to walk through, the process I wanted to walk through, is a process of goal setting that will actually help you end up setting just one very important goal. Dr. Jain: 07:55 One goal. Blaine: 07:57 One goal. How can we possibly do this with just one goal? Dr. Jain: 08:00 Yes. Well, that's the question, right? But that's also the really interesting part. That for most people, it's very easy to write a list of goals, right? I would like to get more sleep. I'd like to drink more water. I'd like to exercise more. I'd like to do this, I'd like to do that. But they don't actually think about, what are the lifestyle changes that any of those goals would require? Honey: 08:23 And it's almost easier I would think to, you know, make this big list. Because then you're not forced to commit. Dr. Jain: 08:29 Correct. And you're not forced to actually consider deeply what is going to make the biggest difference in your life. Blaine: 08:36 That's really interesting. I mean, I'm a big believer in the power of one, but I never thought about it in the context of setting goals. Dr. Jain: 08:42 And it's really, really powerful. Both in terms of the outcomes ... Which is to get that one goal ... But also in the process. Because it offers an opportunity for two members of the couple to have some really deep and important conversations about what they want, how they want to get there, and what they're gonna do together. Honey: 09:04 And, you know, and I think that it's a conversation that we should have more and we have less. Because we're so busy getting things done that to stop and discuss how we want to make it happen or which one thing really matters and intellectualize that, it's really hard to give ourselves the liberty and the time to do that. Because we're too busy taking things off the list for clients and such. Dr. Jain: 09:27 Absolutely. And it's really difficult because it can be painful that you're both are so in sync, and then you start to have this conversation about, "Where do we go from here?" And you find that you're kind of like that cart that has two horses pulling in different directions. And that can be really difficult to try and work through. Especially on something where normally people are very optimistic and they're feeling very hopeful about the New Year and the new goals. Honey: 09:54 Well, let's slap that hope right out of them. Blaine: 10:00 I guess the thing we need to work on now is, "How do we go about doing this?" Because sitting down and writing a list is easy. But sitting down and writing a list of one and coming to some kind of concurrence on it, that's a whole new dynamic. Dr. Jain: 10:12 It is, absolutely. So let's go through a process to do that. The first thing to look at is to understand if you are talking about the same goal. And so the way to do that initially is to list whatever your goals are. So let's say that you sit down and you list out maybe three or five goals, just generally of what you'd like to accomplish in the next year. And the second thing then you want to talk about is, "Why are these our goals?" Like, why did they make the list of all the things you could think of? What are you trying to accomplish with this set of three or five goals? Dr. Jain: 10:46 And then what you want to do is you want to look for the level of agreement on the goals. And that's where the discussion actually starts. Because let's say that you have very different goals for the two of you and for your business in this next year. You have to have a conversation about which goal takes priority. From that will come the conversation of, "Is there a way to find a common meeting ground? Or is this the kind of goal where there is no common meeting ground and we just have to commit?" And there's some negotiation that has to happen with that, especially if it's not your goal that's being picked to be worked on. Dr. Jain: 11:22 So that's a framework of the exercise. And we can get to the exercise in a minute. But really, it's about deciding, what are your goals? And then talking about whether you have agreement on the goals even to begin with. And then, how do you decide which goal takes priority? Blaine: 11:40 This sounds like a lot of work. Honey: 11:45 Yes, it's deceiving. And I really like the point that you made, you know, the question of, "Why is that your goal?" And that, again, comes to, "Does it mean something different to you than it does to me?" Dr. Jain: 11:58 Absolutely. And if you look at it as a psychologist, I really see that all of our goals at a baseline level, they're designed to make us happier. We believe that achieving that goal is going to make us happier. If you look at that as kind of the basis, it gives you a really good place to start the conversation from. "Why will that make me happier?" Or, "How will that make me happier or us happier?" And that's really where the conversation wants to go because that's really what you're talking about with goal setting. It's not setting goals just because you want to set goals, it's because you believe it's going to improve the quality and enjoyment of your life in some way to have obtained that goal. Blaine: 12:37 So we should all be throwing away our copies of The Goals of My Discontent? Dr. Jain: 12:41 Yes, exactly. That's right. And really, the issue of happiness, right? It has been something that people go on retreats. They meditate on it. They read a lot about it. They think about it. What makes us happy at one point in our life isn't what makes us happy later. And so this is why the process is rich. And also why it can be difficult. Because to your point, Honey, when you were offering the idea that it's always so busy. There's always so much to do. You know, we're raising kids. We're taking care of our aging parents. We have clients who need us. We have things happening at our house. We sometimes want to go away together and spend time together and not worry about anything. Dr. Jain: 13:22 And so then to sit there and really use whatever free time you have to decide what deeply is going to make me happy, it's not easy to do. But I believe the rewards of it are so valuable. Blaine: 13:35 Yeah, I was just thinking. Spending more time together is probably the last goal we need. Honey: 13:41 Well, we really spend a lot of time together, but speaking specifically for us ... And I'm sure we're not alone in this because we work together ... When we stop working, we tend to want to stop, you know? Even though ... And I tend to be the one who keeps throwing out things in the middle of not talking about work that are about work because I can't stop making lists ... But we tend to want to just stop doing for a moment. Blaine: 14:09 That should be a goal. Spending more time together and less doing. Honey: 14:12 That might be interesting for us. Dr. Jain: 14:15 And so Blaine, why would that be your goal? Blaine: 14:17 Why would that be my goal? Because it seems like most of our time together ... Well, it is all high-quality time ... Most of it is high-quality work time. Honey: 14:24 Yeah. We make everything a project. Dr. Jain: 14:27 Okay. That would be a great place to start looking at. Because you could basically ask the question that, you know, "If we didn't make things a project, what would we do otherwise?" Or, "How would we spend time together that's us spending high-quality time together, not about work?" Blaine: 14:44 No, I think we'd be on a beach somewhere with blender drinks. Dr. Jain: 14:47 Do you think that, Honey? Honey: 14:50 Not blender drinks for long 'cause that just smacks of a headache. But, you know, it's interesting. When Blaine and I were talking about this and we were talking about goals, it was a hundred percent about business. But I think an amazing win for Blaine and I would be to just relax, you know? Just be where we are, be in that moment. Whether we are skiing or we're sitting on a beach, and just enjoy where we are without thinking about what the next chess move is. Blaine: 15:24 Chess move, I like that. So Dr. Jain, what you're saying is we should be doing this exercise, and obviously, there've gotta be steps for it. It's an exercise. What are the steps? What steps do we have to go through in order to have this productive session where we sit down and hash it out with each other and with any luck not come to blows? Blaine: 15:56 Let me ask you a question. I'm sorry to interrupt. You said sessions. And sessions sounds very scheduled and sounds like very focused allotments of time. So should people be scheduling this? Should they set up a calendar and say, "We're going to have these times allotted during the week to work on this"? Blaine: 16:48 That's my fear. Blaine: 16:50 If we don't schedule it, we'll never get to it. Dr. Jain: 16:52 Right. And so it could also be that you schedule it lightly. And by that I mean you say, "Okay. Well, let's plan to talk a little bit every night this week. Or, you know, a few times this week." And then when you get to there, you can kind of do a temperature check with each other and say, "Do you feel ready to talk about this? Do you feel open? You know, is this a good time? Or how are you feeling?" But just the idea that you do want to have the conversation because it is really important and that's sort of setting the tone for your year together, this next year. Dr. Jain: 17:20 So you want to start by jotting down, you know, goals that you think would be important. You'd want to compare your lists for those goals. And then you want to see if there's any goals that match up. And just be aware of that as you go into then any specific steps of the exercise. Dr. Jain: 17:40 And so this process that I'm gonna take you through comes from the process of appreciative inquiry, which is from a book by Kurt Wright called Breaking the Rules. And it's a really valuable process for helping us get out of problem orientation to like possibility orientation. So we start to think bigger. We start to be more expansive. It gives us greater access to kind of a wide range of ideas and thoughts. Dr. Jain: 18:07 So the first step of the exercise in the sort of appreciative inquiry process is to actually then, each of you, write down and discuss this question of, what did we do very well this year? So the question is, what did we do very well this year? And then you both want to spend some time jotting down your answers and you want to discuss that. And for those of you who are very scheduled, maybe you do that on, you know, a Sunday night. Then you tackle the next question maybe the next day. Dr. Jain: 18:38 And that question is, where could we have done better? Again, what's important is where we could have done better. Not where could I have done better, but where we could have done better. And then better is in whatever way you think better. Honey: 18:52 I think it's interesting that you talked about doing these on different nights. Because it's so very easy to rush through this and say, "Okay. Well, the answer to the first question is this. The answer to the second question is that." And it's not at all fun. And my guess is it's not gonna get you to where you want to go. Dr. Jain: 19:10 Absolutely. And you can ... Look, I do this process for myself for my own goals. And I ... You know, and I just change we to I. But it is something that you can get through. What I do find personally is by the time you get to the third or fourth question, it's very difficult to make that shift. So you might be able to say, "What did we do very well this year? And what could we have done better?" Maybe the same night if you can. But the last three questions I definitely find are better. There more effective if you can space them out in time. Blaine: 19:40 Okay now. Just to recap where we are. "What did we do well this year?" Honey, we didn't do anything well this year, did we? Honey: 19:46 We did everything well. Blaine: 19:48 No, we're in disagreement on this. We're obviously going to have to talk it out later. Next, what could we have done better? We could have done everything better. Isn't that right, Honey? Honey: 19:56 Nothing gets better than what we did. Blaine: 19:58 Really? Alright. There's another question we're going to have to argue about. What next? Dr. Jain: 20:02 Then the next question is, what did we want to create next? Or in this New Year? If you're doing it for goal setting. Blaine: 20:08 Honey, do we want to create anything? Honey: 20:10 Yes we do. Blaine: 20:10 We do? Okay. Dr. Jain: 20:12 This question, again, it tends to be a very expansive question. Because many times people will have things that they did well that they feel really good about. They have a lot of things that they feel like they could have done better. I know when they think about what they want to create in the New Year, it becomes like that list that I had mentioned earlier. "I want to lose weight. I want to sleep more. I want to do this, I want to do that." And so that is another point where you as a couple sit there and say, "What do we want to create in the New Year?" You may have to go back and do a little bit of agreement on that. Blaine: 20:42 What you were saying up until then, it just sounds like people want to create chaos of a list. Dr. Jain: 20:47 Yes. Yeah. I don't know. It doesn't feel like chaos of a list, but it feels like ... You know, it feels like I want to reach all my goals all at once. Honey: 20:58 And I think that it's also interesting because what you want to create in the New Year could be this very, very large umbrella thing that covers work and life. Or it could be something much more specific. And it doesn't necessarily have to be this complete life makeover thing. It ... You know, it could be one thing for the business, you know? It could be ... You know, "We do this and that very, very well, but we keep tripping on this. So my goal for this ... For 2019 is this one thing we keep tripping on is to finally smooth it out." You know, which is not an overarching life thing. Dr. Jain: 21:37 Absolutely. And so that thing about what we want to create, it pulls for a kind of expansion. It pulls for an expansiveness of ... In the answer. I want to create this and I want to create that. But it also can be something very specific, you know? That I want to create a schedule where I can be in bed every night by 10 o'clock. And that could be really ... Or, you know, we wind down by 10 o'clock every night. Or something like that. So it's a good question then at that point to check back in with each other again and say, "You know, what are talking about here?" And really, there's no right or wrong answer. It's just a way of having a conversation to try and understand each other better. Blaine: 22:17 Okay, to recap. So people can try and keep track here. "What did we do very well this year? What could we have done better? What do we want to create in the New Year? Or next?" Dr. Jain: 22:27 Yes, yes. And then the fourth question is, what resources do we need? And the resources is really to answer what we want to create. So that's why there needs to be some agreement at that third question because then you can start talking about the resources. And talking about resources is where that goal starts to become more real. And again, it's that thing where if you have 15 items on the list, it's very difficult to come up with resources for that many goals. Dr. Jain: 22:56 So already you start to have a narrowing of focus because you'll find that your idea about resources, it kind of naturally floats to the top about what's important. And that in turn can kind of tell you what goal is the most important. Blaine: 23:11 So, "What resources do we need to do that?" Then what happens? Dr. Jain: 23:15 And then what happens is you want to take all of those answers to those questions and you want to decide together what one goal is your overall focus for the New Year. Blaine: 23:27 This sounds like work. Dr. Jain: 23:29 It is work. It is work. Blaine: 23:30 When you said the power of one, I was thinking we could dash this off in a couple of minutes. Dr. Jain: 23:34 Yeah. But what you'll find is you will find if you actually take the time to do this exercise, as we've discussed it, you will find that it offers a chance to reconnect with your partner and to increase your sort of foundation with agreement with each other. And no matter what you decide or don't decide or no matter what the outcome is of the discussion, you will feel closer and you will understand each other better. Honey: 24:01 I actually find the whole thing very inviting. Like, I really am looking forward to doing this. Because I feel like we're gonna come to something that we can then act on and have a positive result. Dr. Jain: 24:13 And this is a great process because it gives you a chance to actually appreciate. That's where the appreciate inquiry comes from. It gives you a chance to appreciate what actually you've done really well. And then it gives you a chance to sort of inquire, you know, what's next? And then, where are we gonna put our energy? Dr. Jain: 24:31 And then I just wanted to make one point about why just one goal. And the reason for that is really simple. It's because it's very difficult to do multiple things well at the same time. Honey: 24:42 That is the truth. Blaine: 24:44 And one of the things we bang the drum for routinely is the singularity of focus. How you can focus on only one thing. You can't focus on two things. And your brand, your brand is the one way your core customer should feel about your business. Feel, because decisions are made emotionally. Core customer, because once you know who you're speaking to you can speak in a voice that has resonance and matters. But if you don't focus on the one way, it's all for naught. If you can't be singular in your focus, nothing happens. Honey: 25:13 I can think back to the different times in my life where I pursued one thing with gusto. And it always worked. Every single time. And I'm sure everybody else can look back at their life and think to those moments where they kind of blocked everything else out and said, "I'm going to make this thing happen." And it happened. Blaine: 25:33 Yeah. So, now I need to ask an important question. Because I know that everybody out there is already operating at time deficit. And there's a lot of a short attention span happening out there. Is it possible that a couple can sit down and do this in just one hour? Dr. Jain: 25:46 I think that would be really difficult to do. But, I think that you could probably do it if you sit down and you have solid agreement on the first three questions about what you did well, what you could have done better, and what you want to create. Even if you can do that part of the conversation in an easier way ... Like going for a walk together or something. It doesn't have to be like sitting down and having like a team meeting type of thing. But if you can just get to that, those agreement up to that level, I think then that in perhaps a shorter period of time you could go over what resources you need and then, what is your one goal? Dr. Jain: 26:23 The other thing I just wanted to point out about the exercise is that the reason we go into what resources do we need first before we decide on the goal is because sometimes when we make a list or we have some understanding of what the resources are that we need, it changes whether this is the right time to pursue that goal. Honey: 26:44 That's interesting. You know, I was wondering why the resources came first. Dr. Jain: 26:49 Yes. Logically, it seems like you should decide on your goal and then look at your resources. The reason the resources come first and the reason it's important to do it that way is because you may find that certain of your goals ... Like if you discuss what you want to create and let's say you end up with three goals that you both agree on ... You might find that the resources to meet one of those goals is much more than you have available right now. And if that's the case then that goal is crossed off or moved off the list for the time being. Honey: 27:19 M'kay. So before we sit down and do this exercise, before Blaine and I sit down and do this exercise, we should each individually make our list of what our goals are for the year? Dr. Jain: 27:30 Yes. And so you want to make your list of what your goals are. You want to then compare each list together. Then you want to go back and you each want to do the "what did we do very well this year" question. Then you want to discuss that. "What could we have done better?" Then you want to discuss that. And then, "What do you want to create in the New Year?" And then you want to discuss that, because that's where it starts to become like, "Okay, this is our huge big list, and these are the three things we've landed on." Then together, you do the "what resources do we need", because that way you both can discuss what resources we need. And then out of that conversation comes, "What one goal is your overall focus?" Blaine: 28:13 I'm actually kind of disappointed. I was hoping this conversation would take about three minutes. We'd have it all figured out. And we'd all go have cocktails. Honey: 28:18 Well, that's how we typically operate. Which is probably why we needed to have this conversation. Blaine: 28:23 Good point. Okay. I'm in. Dr. Jain: 28:25 And that sort of having the conversation, doing the work separately, coming together to discuss and then coming together for the last few questions, it's a really nice exchange that can happen. Blaine: 28:38 Also as an aside, this sounds really potent and really useful. And could be the best tool we've gotten in 2019. What do you think, Honey? Honey: 28:45 Well, I think it's definitely the best tool I've gotten in 2019, a couple of days in. But I'm gonna get the feeling that I'm gonna feel this way months from now. Because I see how this is a positive on multiple levels. It's obviously a positive for setting a goal that we can achieve together. And I think a side benefit is just a time for us to share where each of us is at and what it is we're trying to accomplish so the other person knows, you know, "What are we thinking? What's on our minds?" Because we don't always stop to do that. Dr. Jain: 29:22 I would agree with all of that. Blaine: 29:24 Dr. Rachna Jain, this has been phenomenal. Thank you for this. And I think in order to properly think you for your involvement, we should give you a moment to do a shameless plug. Dr. Jain: 29:36 Absolutely. So if you are interested in learning more about the work I do or just want to learn a little bit more about me, you can visit me online at inloveandbiz.com. And I would be glad to connect with you. So that would be great. Blaine: 29:53 And who wouldn't want to know more about Dr. Jain? Honey: 29:56 I will say for our listeners, because Maryland is our third-largest audience, Dr. Rachna Jain is actually in Maryland. It's a great state. Honey: 30:09 Tiny but potent. Dr. Jain: 30:10 But tiny but potent. Exactly. Blaine: 30:12 It is kind of fascinating. It's often ... The largest is California. Then Utah. Then it's often Maryland. Yeah. Dr. Jain: 30:18 Wow, that's interesting. Blaine: 30:20 Two big states and then one tiny, little state. And thank you for being from Maryland, too. Honey: 30:25 Dr. Jain, I want to thank you so much for your time and your insight. I love it. Every time we do this I feel like it's a gift to us. Dr. Jain: 30:33 Well, thank you. I really enjoyed spending time with you both today. Blaine: 30:36 Well, you know, pretty soon I think our Top 10 shows are all going to be featuring Dr. Rachna Jain. Honey: 30:41 Once we do 10 of them. Dr. Jain: 30:43 No pressure. No pressure or anything. Blaine: 30:45 Yeah. Dr. Jain, thank you very much. Dr. Jain: 30:48 Thank you. Blaine: 30:51 This has been Goal Setting with Dr. Rachna Jain of inloveinbiz.com. If you would like to see the questions from this exercise written down, just go to coupleco.com/exercise. That's coupleco.com/exercise. Honey: 31:06 If you enjoyed this podcast and you think it would be useful or fun for other couple entrepreneurs, or really anyone, please go to iTunes and leave a star rating and a review to help them find it. Blaine: 31:17 And join us next time when we head off to Calistoga for a very important CoupleCo for The Killer Cabernet. Honey: 31:22 The Killer Cabernet. That is true. We'll be sitting down with none other than the purveyors of the world-famous Date Night Wines, Shane Pavitt and Suzanne Phifer Pavitt of Phifer Pavitt Wine. Blaine: 31:34 This couple is one heck of a pairing. Coming to the Napa Valley with a series of business shops and a love of libations. Honey: 31:40 Suzanne Phifer Pavitt is one inspirational business woman who has no problem being out in front and leading the charge. Blaine: 31:47 And Shane Pavitt has no problem being in the background being the CFO and the guy who's willing to do all the odd jobs that need doing. Honey: 31:55 I loved that he said that. Join us for a chat with two movers and shakers who overcame all kinds of obstacles to build a highly-respected business in a very difficult category. Blaine: 32:05 Next time here on CoupleCo: Working With Your Spouse For Fun & Profit. Honey: 32:09 Copyright 2019. All rights reserved. Blaine: 32:11 Love you, baby. Honey: 32:13 Love you, too.